Find a joint where there are too many branches, Make a diagonal cut with the longer side of the cut on the side where you'd like new growth to appear or continue growing. This joint has many other branches growing vertically which can be encouraged to grow upward rather than sideways. 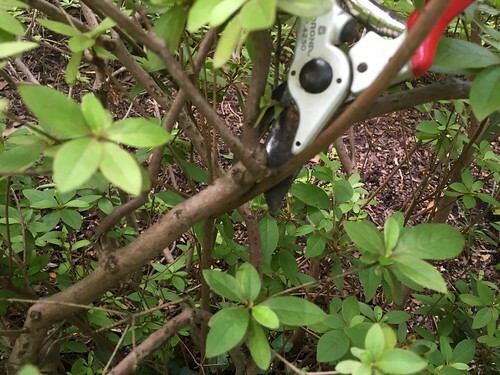 Azaleas can take very hard pruning. It's very hard to make a mistake with Azaleas (a type of Rhododendron).